It's more of a wish than solid information at this point, but still worth the attention. 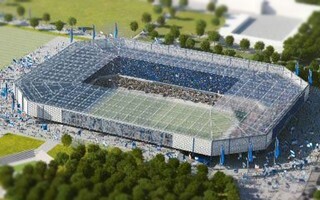 When Hertha is 133 years old, on July 25, 2025, their new stadium should open its doors to supporters. Exactly 55,137 of them. On Monday evening Hertha Berlin supporters met with club officials to discuss outstanding issues surrounding the club. One of them is the relocation to a football-specific stadium within Olympiastadion. As confirmed by Klaus Teichert, chief of Stadion GmbH, the stadium should see groundbreaking in January of 2022, perhaps within that year's first quarter. Opening? A very symbolic date: July 25, 2025, on Hertha's 133th birthday. It would also be the opening of the 2025/26 season, following the end of lease on Olympiastadion in late June of 2025. Every year Hertha is paying €5.25 million for the current stadium and, according to Teichert, redevelopment of the stadium into a football-specific one would make it far more expensive, in excess of €10 million per annum. Besides, as Teichert said, „Olympiastadion is a great stadium when full, it's a great stadium when empty. Everything in between is bad”. A new stadium, in turn, requires a stable financing of €200 million to build but would then be far easier to manage. The venue, inspired by Athletic Club's San Mames in Bilbao, would have a capacity of 55,137, according to Teichert. The detailed capacity and quite precise time frame for construction may still be brought to a halt, however. Hertha still has to reach agreement with Berlin's senate over lease of land within Olympiapark, where the stadium is to be built. That deal is expected by Hertha in the first quarter of 2019. Another issue is the relocation of residents who currently live within the area, occupying 24 apartments at Sportforumstraße.